Royal Life Centers at Chapter 5 uses several different therapies to best serve our guests. Our holistic approach targets the mind, body, and spirit and helps guests to begin the healing process. We offer group, individual, adventure, activity, and equine therapies. Guests tailor their treatment experience by discovering and choosing what works best for them and their recovery. At Royal Life Centers guests receive the tools needed for success and the power to create their own personal path to sobriety. When guests arrive at Royal Life Centers, they are assigned a primary therapist. Their primary therapist will be there to help with any and all needs during their stay. Therapists perform a full assessment of each guest using a biopsychosocial/spiritual model in order to help determine how to make treatment most effective. From there, guests and their therapist develop an Individual Service Plan (ISP). An ISP helps identify different areas of guests lives that need the most improvement or change. Our holistic model centers around the idea that lasting change comes from mental, physical, and spiritual healing. Group therapy is the primary form of treatment at Royal Life Centers. Guests choose portions of their own schedule, allowing them to decide which groups interest them and will benefit them the most. Groups are facilitated by one or more of our addiction professionals and focus on a wide range of topics. A few examples are relapse prevention, goal-setting, self-discovery, and anger management. A group setting encourages our guests to be open with their peers which is extremely important to long-term recovery. Further, practicing these skills in a safe environment makes the transition after treatment that much easier. Along with traditional, classroom style groups, we also offer more hands-on forms of group therapy. Movement/activity, adventure, as well as equine therapy, are all a part of our diverse programming. Guests can choose to participate in activities such as yoga, kayaking, physical training, and ropes courses. Exercise and other outdoor activities can have an uplifting effect on someone’s mood and spirit. Additionally, many of these other activities build self-esteem and promote teamwork. Guests will form a new sense of self-worth and self-confidence through gaining a better understanding of themselves. Our goal is to supply all the tools needed for positive change and have our guests succeed and live long, successful, sober lives. If you have any questions about Royal Life Centers’ therapy programs please give a call to our admissions team at 877-RECOVERY or (877)-732-6837. They are available 24 hours a day and 7 days a week. Royal Life Centers believes in the power of group therapy to make a positive change in an individual’s life. Our various groups are led by knowledgeable, experienced addiction professionals. These open dynamic forums help our guests to achieve lasting sobriety. Together we can do this. Guests sharing their experiences learn how they can relate and help one another. Guests will also learn what is motivating and supportive to their recovery. These therapy sessions build a network of support for the guest. Guests see they are not alone in how they got to where they are. “Hey that happened to me, here’s what I did that worked”. Voicing a troubling experience to a group and how you overcame that issue is invaluable to others. Then, with solution-based guidance, guests learn to overcome problems and obstacles. Groups help our guests go from fear and doubt about their recovery to confidence in their ability to remain sober. Maybe it’s their first time getting sober or maybe it’s several attempts later. Either way, Royal Life Centers believes everyone can get and remain sober. Generally, group therapy in substance use disorder treatment is in five areas. Psychotherapy, cognitive behavioral, skill development, supportive, process therapies. Other group therapies used at Royal Life Centers include; 12 step method, relapse prevention, community involvement, cultural, expressive, physical training, recreation, and leisure groups. At Royal Life Centers our therapists and facilitators welcome and appreciate input from all our guests. Open discussion and education on substance use disorder are encouraged. Once they get comfortable, guests engage each other in a welcoming, inclusive, non-judgmental space. In detox and residential treatment, our guests attend groups five hours a day, every day. In PHP guests attend groups six hours per day Monday thru Friday and three hours on Saturday. During the IOP phase, guests first attend three hours a day, five days a week, then transition to attending three hours per day three times per week. If you are interested in learning more about our programs and facilities please contact us 24 hours a day, 7 days a week at 877-RECOVERY or (877)-732-6837. At Royal Life Centers at Chapter 5, each guest is assigned a primary therapist upon admission. Guests will work very closely with their therapist as they progress through their treatment. Our experienced therapists conduct an initial biopsychosocial assessment of each guest to determine what types of therapies would be of maximum benefit to them. Then, therapists then develop an Individual Service Plan (ISP) for each guest to identify strengths and weaknesses and plot a course of action for positive change and improvement. Our therapists work one-on-one with our guests in an open-minded, non-judgmental, safe environment. The idea is for the guests to overcome and work through issues such as personal obstacles and defeats, negative emotions, dysfunction, low self-esteem, and poor coping mechanisms. The key is to get to the core of the issues that cause addiction. Guests co-occurring disorders are also addressed in our holistic therapies. 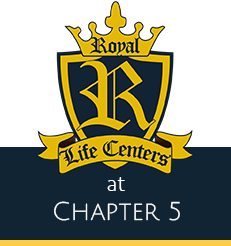 What makes Royal Life Centers at Chapter 5 different? At Royal Life Centers we do not believe that predetermined treatment plans work when treating a person with substance use disorder. Instead of using that outdated method, we make sure our therapists and staff have all the needed resources, tools, and skills to develop an individualized treatment plan and implement it for each guest. This special, individualized plan ensures that the guest’s unique circumstances needs and goals are met. Our trained therapists use a combination of therapies including cognitive behavioral therapy to address things like dysfunctional thinking and behavior. These individual sessions are where the guest and the therapist work as a team. They work together to understand the issues and solve and prevent problems. Our guests and their well-being always come first at Royal Life Centers at Chapter 5. Our individual therapy helps guests to better understand themselves and how they relate to their substance use disorder. It gives the guest an opportunity to address issues head-on in a safe environment and build a plan for the future. Guests learn how to live a great sober life, handle life on life’s terms, and be happy and successful. If you’d like to learn more about our treatment options please call our admissions department 24/7 at 877-RECOVERY or (877)-732-6837. At Royal Life Centers, we prioritize all aspects of health. Specifically, exercise and physical activity are extremely important in the early stages of recovery. Oftentimes individuals will neglect their own physical health during periods of substance use. Engaging in regular exercise patterns encourages not only physical wellness but mental as well. Studies done by the U.S. Department of Health and Human Services, Harvard Medical School, and the American Psychological Association(APA) found that a reduction in depression and an improvement of cognitive function are a direct result of exercise. Additionally, it has also been proven to relieve stress, raise cortisol levels in the body, improve overall mood and increase production of endorphins. Royal Life Centers offers various adventure therapies for guests to help them in the healing process. For example, one of the many tools we utilize is a ropes course, for its group therapy power. Designed to encourage teamwork, ropes courses help guests face personal obstacles outside of their comfort zone. They also assist in establishing trust, building muscle strength, and cultivating self-confidence. Ropes course leaders teach guests how to use cables, ropes, and harnesses in a supervised, safe setting. Even more, teaching someone a new skill has been found to reduce anxiety levels, boost confidence, increase self-reliance. Another form of adventure therapy that Royal Life Centers employs is outdoor activities such as hiking, kayaking, white water rafting, and camping. Guests travel under supervision to various locations such as the Sedona Mountains, Colorado Hot Springs, Camelback Mountain and more. The therapeutic power of nature and exercise have been shown to have considerable effects on mental health and well-being. Participating in group activities promotes problem-solving, communication skills, teamwork, and self-esteem. Along with adventures, we also offer different types of therapies, such as yoga and equine therapy. If you or a loved one might have a problem with addiction, please contact us at 877-RECOVERY or (877)-732-6837 24/7 to speak with someone. Compared to more traditional methods, such as group or individual therapies, activity therapy promotes healing through creativity. These activities exercise different parts of the brain and benefit the guest with more productive thoughts. In our holistic approach, this includes creating music, art, movement, and journaling for therapeutic purposes. These activities happen in a relaxed environment to help each guest keep their focus on rehabilitation. Expressing oneself through creativity helps initiate positive thought patterns. This also creates a feeling of accomplishment which can help mend previous confidence issues. The way a guest feels about their work can also help therapists locate concealed personality issues. This is a great tool to help guests recognize underlying issues that relate to their substance use. Visual Art Therapy, such as painting, drawing, and sculpting, promotes the free expression of thoughts and feelings. Artwork stimulates healing, as emotions tend to come out through creative expression. This can help relieve feelings of stress and manage anxiety. Additionally, research has shown that art therapy can be productive in treating other issues such as depression, anxiety, PTSD, and ADHD. According to the American Music Therapy Association, music therapy is beneficial in a number of ways. It helps manage stress levels, eases pain, enhances memory, improves communications, and also promotes wellness and physical rehabilitation. Music has a way of extrapolating emotions, allowing the guest to begin healing. We offer seminar-style music groups and have a studio under construction allowing the guest to express themselves through creativity. Recording emotions on paper can be a strong visualization that allows guests to discover themselves as well as unveil hidden emotions. This method has shown to reduce stress, help cope with depression, and manage feelings of anxiety. Further, journaling is a great way to show progress as a guest looks back throughout the process of recovery. Royal Life Centers believes that the mind and body share a strong connection and both need focus in order to promote true healing. This is why we offer activities like yoga that connect both in a positive, powerful way. Yoga is an excellent way to relieve stress, increase self-awareness, improve health, change daily routines and promote healthier eating. Yoga has also shown to help the brain rebuild neuronal disruptions caused by substance abuse according to the National Institute of Health(NIH). If you have questions about the different types of therapies Royal Life Centers offers, please reach out to us at 877-RECOVERY or (877)-732-6837. Our team is available 24/7 to help you with whatever you may need. Equine-assisted therapy (EAT) is one of the many therapies offered in our aftercare program here at Royal Life Centers. EAT is a form of therapy involving interactions between guests and horses. Guests do not typically ride the horses but engage in grooming, petting, leading, feeding, or caring for them. Additionally, EAT promotes emotional growth by allowing the guest to interact and observe in order to identify behavior patterns and emotions. Working with horses has been shown to have a number of positive benefits, including an increase in cognitive skills, reduced stress, and help managing anxiety. Individuals who are experiencing severe anxiety tend to avoid challenging or foreign activities. Horses have a very heightened awareness of their surroundings and which makes them very responsive to human interaction. As a result, this allows guests to create a relationship with the animal-based around an emotional trust level. Teaching our guests to take an individual sense of responsibility when caring for an animal, helps to teach them how to care for themselves. These routines allow our guests to start to handle personal obligations on their own accord, creating accountability. Horses have become the most popular animal used in animal therapy because of their immediate feedback to the guest’s actions. They are unique in their ability to mirror the feelings of their caregiver. Guest’s will learn to manage their fears and emotions, as their own actions show through the reactions of the horse. This encourages a feeling of calmness and teaches guests to take responsibility for their own thoughts and consciousness. Our staff will lead you or your loved one through a series of activities and questions. For example: Why do you think the horse reacted in a certain way? How should the horse be re-approached after it is clear it is anxious? These questions promote thoughtful discussion and reflection on how to deal with emotions on a personal level. If you would like to learn more about our equine therapy program or any of our other therapy programs, please reach out to our admissions team. They are available at 877-RECOVERY or (877)-732-6837 to address any concerns or answer any questions you may have. Our admissions team is available 24 hours a day, 7 days a week.